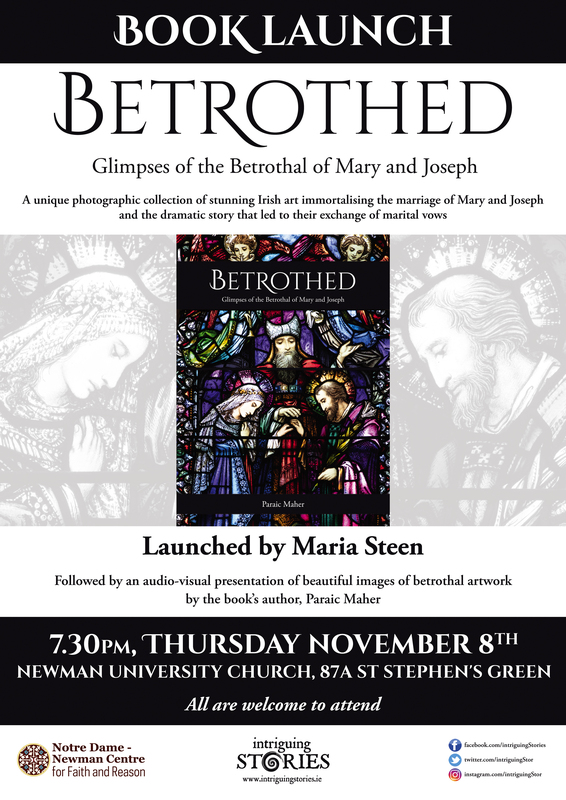 Betrothed, the enthralling book on the marriage of Mary and Joseph, will be launched at Newman University Church, 87A St Stephen’s Green, Thursday, Nov. 8th, 7:30pm and all are invited to attend. The book showcases beautiful stained glass windows and other works of art, from churches all over the country, including many in the Archdiocese of Dublin, of the moment Mary and Joseph exchanged their vows of marriage. It also relates the dramatic story that led to their blessed union and it details the significance of their betrothal. The book will be launched by Maria Steen and there will also be an audio-visual presentation of the artwork featured in the book by the author, Paraic Maher. A reception and book-signing will follow and everyone is welcome!